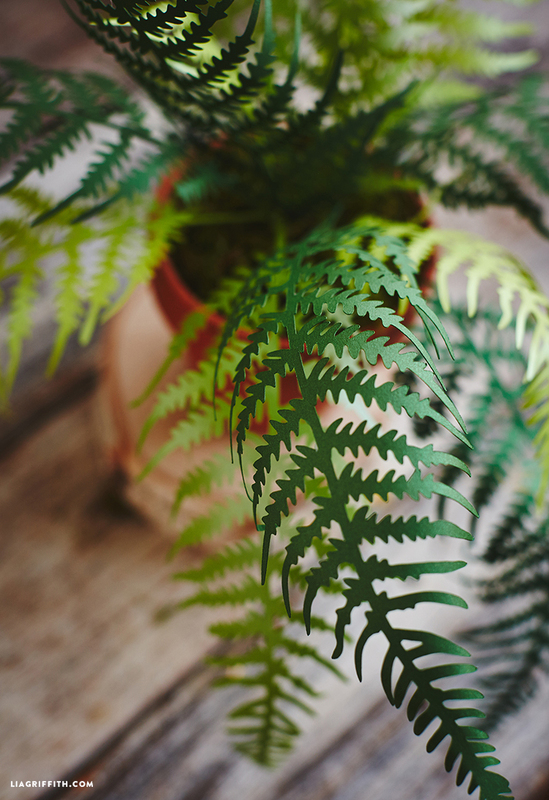 We’ve been on a bit of a fern kick here at the studio. We are just too excited about the arrival of spring! Nature is on our minds, and what better way to appreciate it then to create a tribute to it that will last forever. 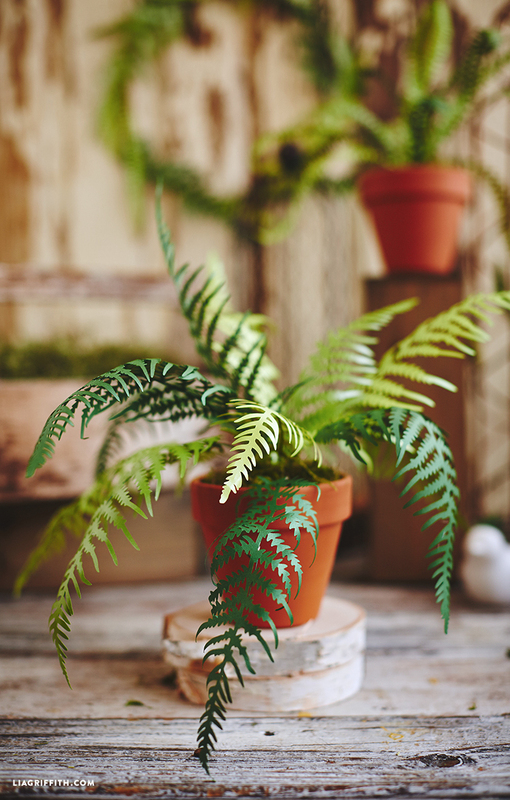 These potted paper fern plants are a wonderful way to add some greenery into your home decor or dreary office space! I can’t even get over how realistic looking these fern plants turned out to be! To make these ferns, we used a variation of three different green text weight metallic papers. 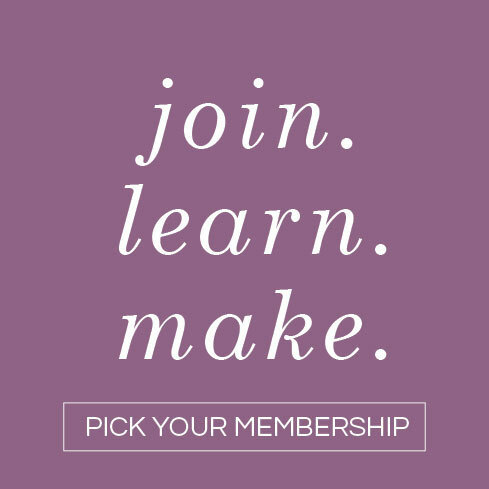 Download the SVG file below if you are using a cutting machine, or the PDF version if you will be cutting by hand. For this project you will need a vase or terra cotta pot, 24-gauge floral wire, a foam ball, and some moss. Cut out your fern leaves and measure your floral wire according the each leaf. You will want your floral wire to be at least 2 inches longer than the leaf. Glue the floral wire to the backside of the leaves, leaving your extra 2 inches coming out of the bottom of the leaf. We attached the floral wire just by using a few dots of hot glue going down the center of the leaf. Next, put your foam ball into your terra cotta pot and cover it with your moss. You should be able to find both the foam and the moss at your local craft store. 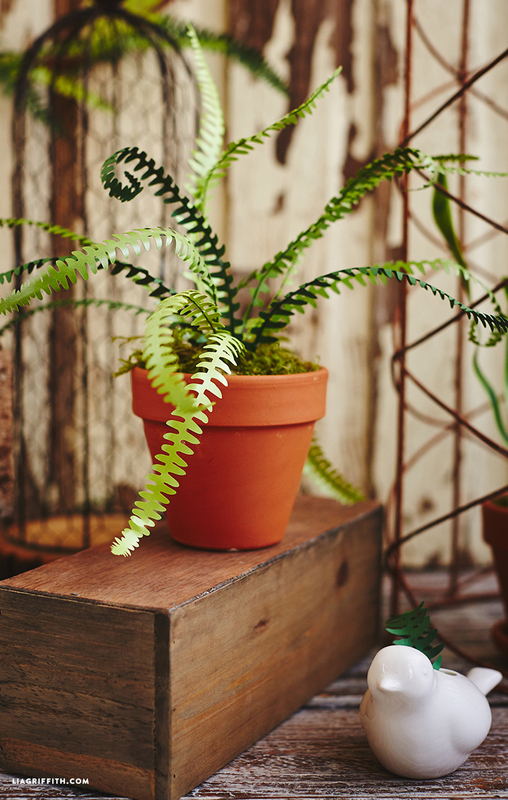 After all of your fern leaves are ready, you can use the extra 2 inches of floral wire to stick your leaves into the foam ball. 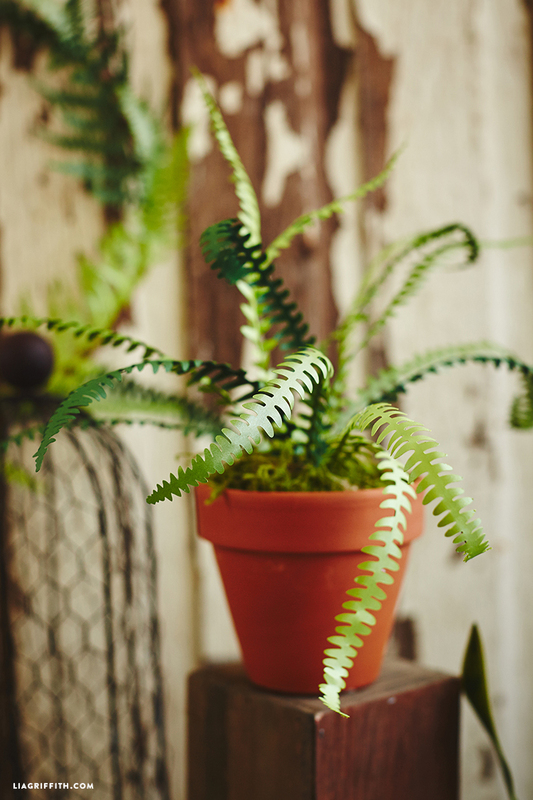 Part of the beauty of fern plants is the whimsical waywardness of each leaf, so arrange your leaves randomly! The floral wire backings even allow you to twist and bend your leaves is really pretty ways. 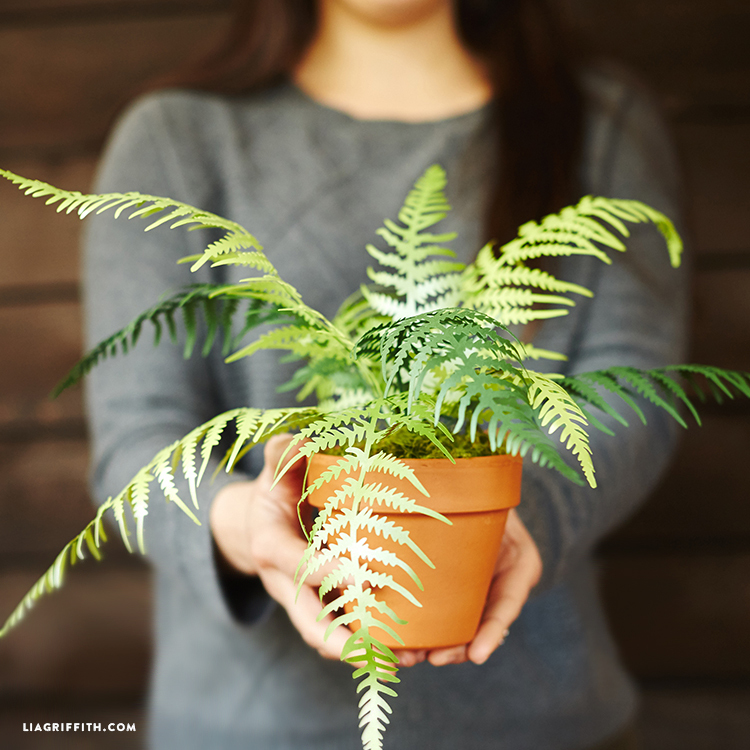 I think these fern plants would be beautiful as fun DIY wedding centerpieces or as housewarming gifts! 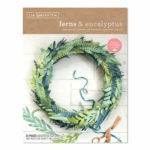 If you are a lover of fern plants, be sure to also check out our paper fern wreath to hang from your wall or front door, and our basic fern leaves to incorporate into floral bouquets! 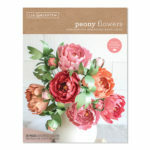 Find more inspiration for paper flowers or DIY home decor, and get to crafting! It’s working! Thank you. I am not certain but I think changing web browsers helped too. 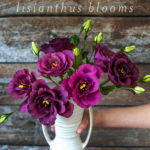 Hi Lia——would love to buy one of your books. I have tried everything to get these fern files to load on my design space and nothing seems to be working 🙁 I downloaded the file multiple times from multiple different projects – restarted my computer and machine multiple times, tried different mats, tried resizing it (and not resizing it), everything I can think of – and still whenever I go to ‘make it’ in the design space, the little green circle just keeps spinning forever. Its the ONLY project from this site (or any other source) I’ve had this happen. Anyone have any feedback on how to fix it? Oh no! Sadly the problem as you’ve described it seems to be with Design Space. We haven’t encountered this issue so I can’t say for sure but it might just be that it’s a more complicated cut and needs more time to process? You might want to take a few screenshots and chat with Cricut Customer Service. Hmm I’m not sure what’s happening! But I just uploaded a new file, give that a try to see if it works? Ack! I have no idea what is going on. What is the error message you’re receiving? 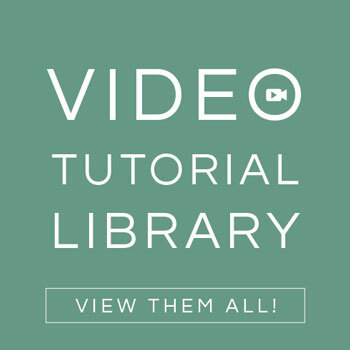 Try the new SVG file that I just uploaded, I made a few slight tweaks that could help?? When I click on the links to the paper varieties they are forbidden. They can’t be accessed. Do you have any other links? Hi Jane, we prefer to use metallic text weight paper. It’s much easier to work with and my ferns peel right off the mat. You might want to try a new blade or cleaning the one you have, and see if a lighter paper does the trick! Hey Lia, I use my iPad with my Cricut Explore. The SVG file is for HP and not compatible with my iPad. 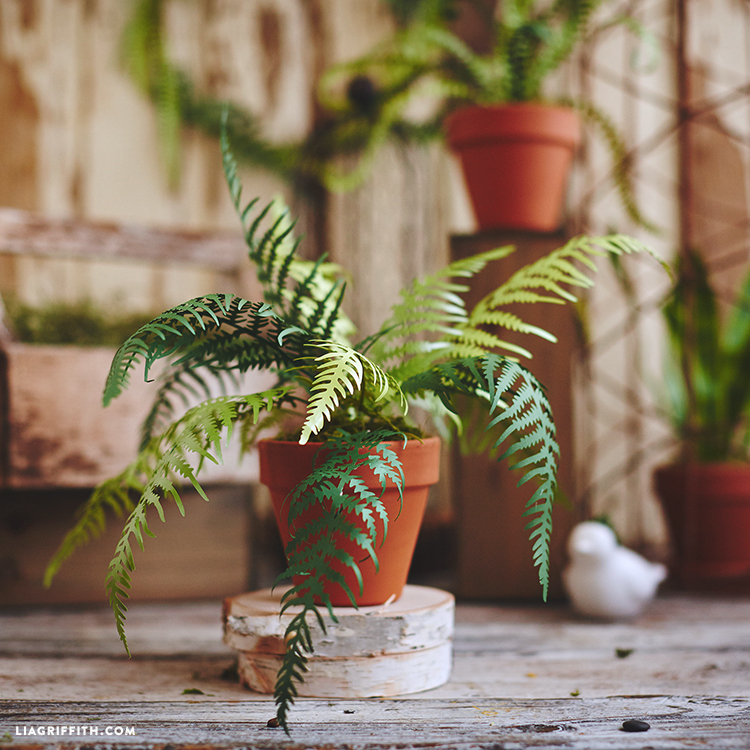 Do you have a file for these pretty ferns that is compatible with my iPad? Thanks! Loving these Lia! Can you tell me what type of glue you used to adhere he 20 gauge wire? Thanks Lia! Just curious, how many leaves did you cut out for this sized pot? I am guessing it is about a 4-6″ pot! I am having trouble finding metallic paper. 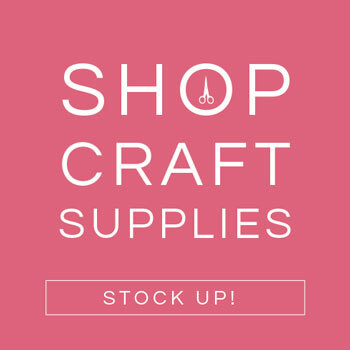 Have tried Joann’s &Michaels, they tell me the other place carries it. Do u have a place on line I can buy it? I’m an amputee & it’s difficult to keep going back & forth. We purchase most of our metallic paper online from Paper-Papers.com, they have a great selection. I truly love these ferns!! Thank you so much! !